The goal of short fiction is up for debate, but it seems to me that, if a story has a single job, it is to subvert the expectations of the reader. A premise is established, an argument unfurls, the reader anticipates where the writer is going, and (in theory) the writer flanks the reader and hits from a different direction. Or doesn’t hit at all. Or hits from all directions at once, or hits in a way that feels more like a caress, or a pinch, or an unnerving tickle. A short story is a chess match that the reader is happy to lose, though he desires to learn something in his losing. Like any opponent, the reader grows and adapts, and the same strategies that worked against him on Monday may not work on Tuesday. The writer, too, then, must evolve, or be relegated to irrelevance. Amie Barrodale is playing on a higher level than most short fiction writers working today. 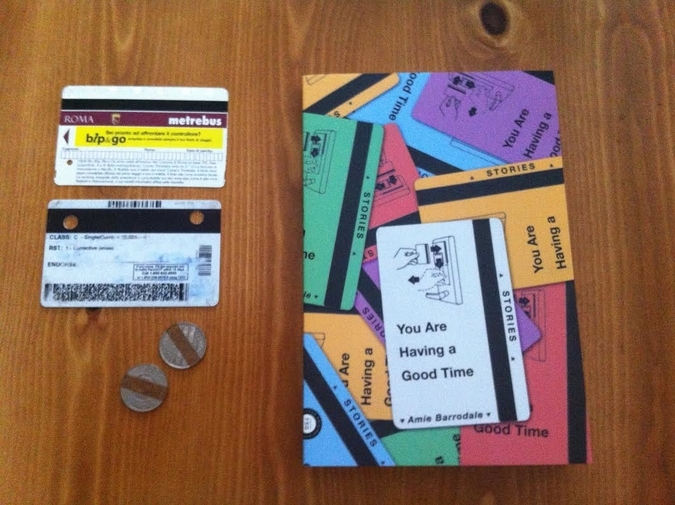 The stories in YOU ARE HAVING A GOOD TIME, released at the beginning of July from FSG, are essentially elaborate feints, Trojan Horses possessed of the discipline to contain their Greeks until the very final moment. The reader frequently reaches the last page of a Barrodale story to find not some mere narrative twist, but a transfiguration: something that recasts the themes of the work, the very tensions that it was theretofore assumed that the story was about. In these cases, the dumbfounded reader has no choice but to return to the first page and read again with new eyes, slightly less of a naif than he was before. What’s your relationship to short fiction? I don’t really know. I used to read a lot of short stories, but I don’t anymore. I don’t know why I write them at this point. The stories in the collection are all from a long time ago, it feels like. Oh, wow. What changed? Is it like, “I didn't leave short fiction, short fiction left me.” Or are you just more interested in other types of writing? In Seattle I pawned this collection of really nice silver, a family heirloom, to take a three-week screenwriting intensive. This was maybe five years ago. It sounds very foolish, but actually I learned a lot from them. One thing I learned was to appreciate Hollywood movies. Before that course I appreciated art movies and classics but not something like Moonstruck. So for about five years I’ve been watching all the movies I missed. Now actually I think I’ve seen them all. So I don’t know what to do. I was starting to watch some Korean movies, which can be excellent, like The Yellow Sea. But then I got the opportunity to travel for a while. So lately I haven’t read or watched movies. I guess now I’m working on something longer, and I’m not reading or watching anything. Oh dear. I was just expecting you to say you that you prefer novels now, not that you abandoned literature entirely to watch ALL the Hollywood movies. But that makes sense, I guess. I noticed you namechecked some films in the book, like Close Encounters and The Departed. What do you say to bibliophiles who make the argument that reading is an active experience, whereas watching a movie is a passive experience, and therefore books are superior to movies? Or do you think the books versus movies war is stupid and unnecessary? I think maybe when I read more I didn’t meditate. Maybe meditation took over that part of things. I started meditating around two hours most days about, I don’t know, maybe six or seven years ago. But I don’t know. I really like movie writing. I like the way good dialogue is written to be open to the actor’s interpretation. And I like the way an excellent movie will state its theme openly. I think if you look at what is being written today, it would be very hard to argue that the best writers are writing novels. I think that’s not such a controversial position. Would you say you’re interested in good writing above all else, rather than being a fan of specific media? Like, you’ll follow the good writers to whatever medium they choose to work in? Of course. I like good writing. Who are the best writers who aren’t writing novels? Quentin Tarantino, Aaron Sorkin, Louis Mellis, Matt Berringer, David Simon, Richard Linklater, Lena Dunham, on and on. But those writers have their works performed. If you read the printed-out lyrics to a song by the National, or a Girls script, do you think it would be as affecting a reading experience as a novel? Isn’t part of what is magical about fiction the fact that it is just dead words on a page, and yet it can still bring a person to laughter or tears? But that’s like saying music is not as good as fiction because you have to play it. I do get a lot of books as a part of my job so I do look them over and I don’t find a lot of good writing there. I will admit that in my experience most screenwriters are totally incapable of writing a short story. Yes, fiction and music are apples and oranges. I guess my argument would be that writing fiction and writing screenplays are also apples and oranges. (Though I realize that I’m the one who equated them by using the phrase “books vs movies.”) A novel or a short story is trying to do something different than a movie or an episode of a TV show, even if they’re all narrative art forms. I guess when people say, “Vince Gilligan is the greatest storyteller in America!” I just hear those people saying, “We don't like to read books!” Which is fine. Most of the people I know don’t read books. But it’s interesting to hear that someone who has published a story collection with FSG (which is the dream of a lot of people, even some of the people conducting this interview) is sort of bored with books. Do you think American fiction used to be better than it is now? What do you think is the cause of its worsening quality? I don't know. I wasn’t around much before 1990. So I just get the stuff that made it, the stuff that we remember because it’s great, and then I have memories of reading in college. In college it did seem like I could go to the bookstore every day and pick up a great new book. But I hadn’t read much at that point. Maybe it has gotten worse. Maybe because we’re all so distracted, we don’t write so well. There’s so much garbage getting published. I don’t think I’m an exception to that. Donald Antrim is great. There is a sparrow outside of my window with a hurt foot. He is hopping on one foot and has the other tucked up. I have been in a cave—or just outside a cave—for about ten days, and I’m experimenting with saying what I think. So I hope I don’t get in trouble. I find this to be a legitimately compelling explanation for why someone becomes a writer. Like, a writer is always writing to correct minor slights committed against him, by people who either forgot those slights immediately or were never even aware of them, people the writer no longer knows and who will almost certainly never read anything he writes. Like, writing is all just a misdirected, time-consuming response to an imagined problem. Is that how you see it? How much do you believe what your Berryman is saying there? Yes, I think that can be true. I think it’s often true of my writing. In this new thing I’m working on, which I have great hopes for right now, I don’t think I’m doing that. But I once made a whole article about that. I was following a young rinpoche for a story for Harper’s, and I was so nervous I was acting crazy all the time—shaking and being pushy and rude. So people were reacting to that, and when I wrote my story, I sort of forgot my whole purpose, and just tried to get revenge on those people by describing their relatively minor quirks. Needless to say that article was a failure. But sometimes it isn’t that petty. Sometimes you yourself don’t know what happened. It seems like nothing happened, but you’re so so upset. So writing is a process of understanding it. Because you start, and you realize so much craziness was happening. And I don’t think that’s bad. At least four different reviews of your book (in Publishers Weekly, the Rumpus, Electric Literature, and the New York Times Book Review) quoted the epigraph. (“There is no such thing as communication. There are only two things. There is a successful miscommunication, and an unsuccessful miscommunication. And when you have unsuccessful miscommunication, you are having a good time.” - Dzongsar Jamyang Khyentse Rinpoche). Which is unusual. Epigraphs are reliably ignored, by readers and reviewers. But this is an annoyingly good epigraph, because it talks about the impossibility of communication — which I think you could argue is the ultimate conclusion of American literature of the last hundred years — but it also suggests that unsuccessful miscommunication is preferable and should be celebrated. Which is a weird idea. What is your interpretation of that quote? I interpret the quote differently, but I like that about it. My husband and I both interpret it one way, but everyone else I’ve talked to about it has a different reading, and I think that’s good. My understanding is that when miscommunication is working, people understand that they aren’t getting their message across. When it isn’t working, they think they are being heard and that they understand what is being said. So they’re having a good time because they’re ignorant.